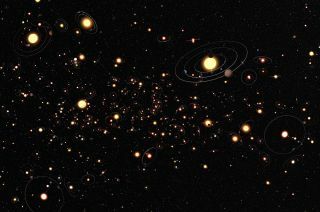 An artist's depiction of alien solar systems of exoplanets. Scientists peering at an alien solar system have spotted a pair of planets so different that their traits may be evidence of a massive collision. The key difference is in the planets' density — although the two neighboring planets are similar in size, one is more than twice as dense as the other. The researchers who measured the density imbalance suggest that the stark difference was most likely caused by a giant impact that stripped away much of the less-dense mantle from one of the planets. Here's how that works. The planets were originally detected with the Kepler space telescope, which tracked small dips in a star's brightness that are caused by a planet coming between the telescope and the star. This approach is called the transit method, and those dips are proportional to the relative sizes of the star and the planet. But a different technique commonly used to identify exoplanets is the radial velocity method, which tracks small wiggles in the star's movement that are caused by the tug of a planet's gravity. That means scientists can use it to estimate a planet's mass. When the team combined the two types of measurements, they realized the two inner Kepler-107 planets were distinctly different. And the system is particularly intriguing because the denser planet is farther from the star than the less dense planet. In other pairs scientists have studied, the reverse has been true, and researchers have come up with a handful of different potential mechanisms that might result in a denser inner planet. But those mechanisms don't make sense when the denser planet isn't the one that's closest to the star. That makes the researchers behind the new study suspect that Kepler-107c became so dense because a giant impact stripped away outer, less-dense layers of the planet. While it may sound exotic, giant impacts seem to be reasonably common — scientists looking in our solar system suspect that they are responsible for puzzles as diverse as Mercury's relatively huge core, the similar compositions of Earth and the moon, and Uranus' strange sideways tilt. Scientists even think they've watched relatively large collisions take place in distant solar systems: At last month's American Astronomical Society meeting, researchers argued that debris clouds twice observed around a star called NGC 2547-ID8 are best explained by large asteroids colliding. Solar systems are just messy places, it turns out. The research is described in a paper published today (Feb. 4) in the journal Nature Astronomy.